The Bell Boeing V-22® Osprey is an innovative and unique multi-role combat aircraft that combines the functionality and vertical performance of a helicopter with the long-range, high-speed forward flight performance of an airplane. The tremendous advantages these capabilities offer is why multiple branches of the US military use it in a variety of roles from equipment and troop transport, to search and rescue, special operations and beyond. 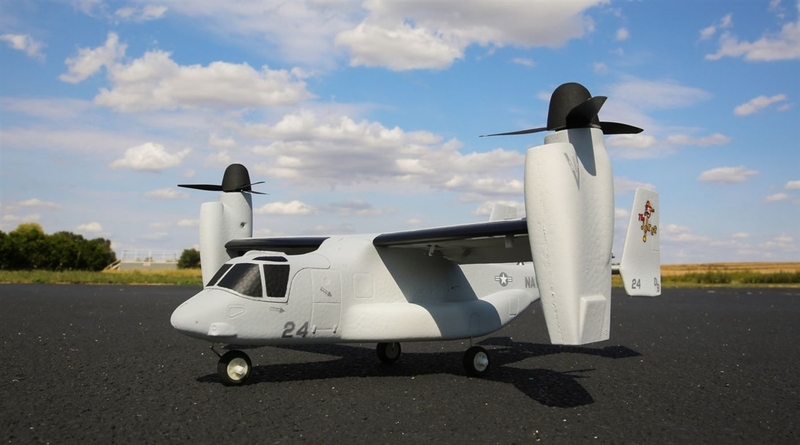 The E-flite® V-22 Osprey is an officially-licensed replica of the amazing VTOL (Vertical Take Off and Landing) capable tiltrotor aircraft that features an exclusive flight control system that makes it possible to fly in both helicopter/multirotor and airplane flight. 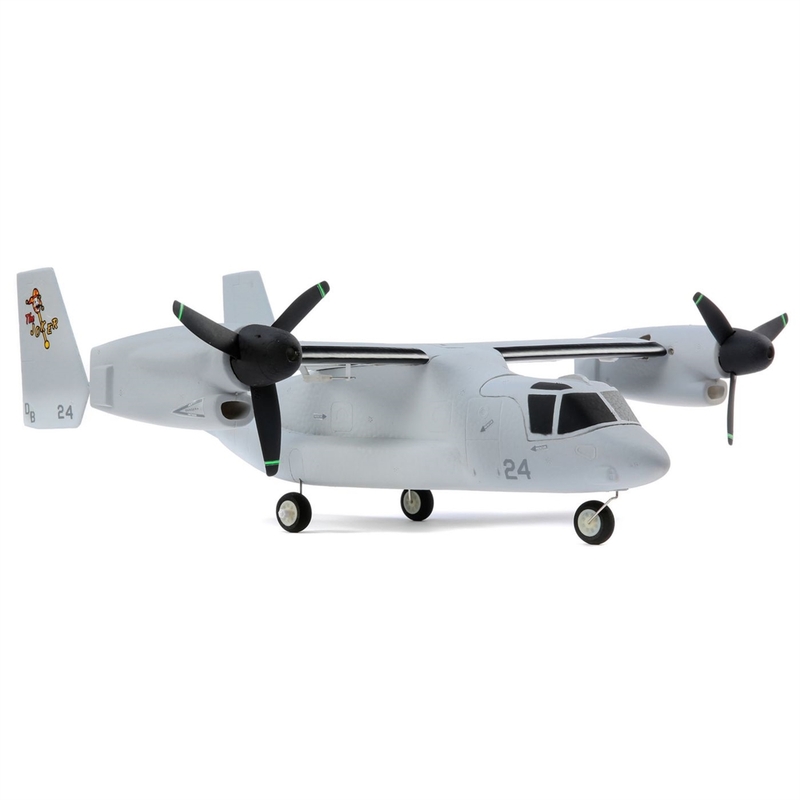 The E-flite® V-22 Osprey is the scale VTOL (Vertical Take Off and Landing) model you've always wanted. It's an officially-licensed replica of the unique and innovative Bell Boeing tiltrotor aircraft that combines the vertical functionality of a helicopter with the forward flight performance of an airplane. The exclusive flight control system makes it possible to fly in both helicopter/multirotor and airplane flight, and the optimized software makes the transition so simple and predictable that you will feel comfortable and confident even on your first flight. Simply flip the flight mode switch and the V-22 will automatically adjust the tiltrotor positions to transition into forward or hovering flight. Best of all you can have the V-22 in the air in almost no time at all! The airframe arrives fully-assembled with a factory-installed flight controller, servos, motors and ESCs (plus a Spektrum™ serial receiver in the BNF Basic version). It's also factory-finished in multicolor paint, and the included decal sheet allows you to customize the finish with multiple military branch trim scheme options. The super-simple transmitter setup only requires assigning one switch for flight mode selection, then you're ready to install a fully charged 3S 11.1V 800mAh LiPo battery (sold separately) to fly. You also have the choice to install the landing gear with a castering nose wheel so you can taxi and perform 'rolling' take offs and landings, or you can leave it off to enjoy the 'retracted' gear look. 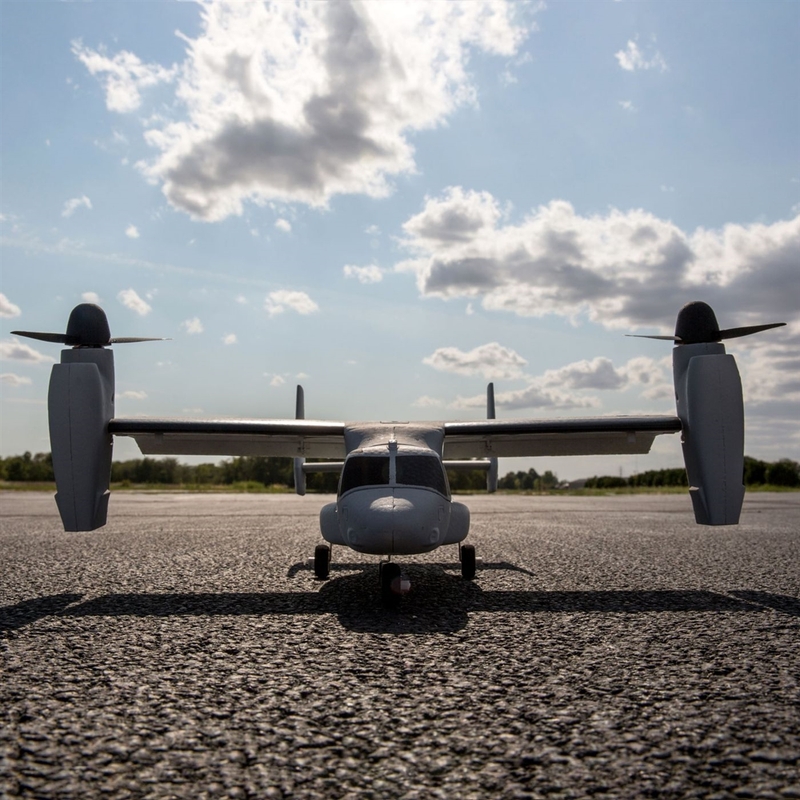 The E-flite V-22 Osprey's incredible vertical takeoff and landing capabilities, combined with its compact size and lightweight yet durable composite-reinforced EPO airframe, makes it possible to fly in places and spaces many other RC models can't. And no matter where you fly it, the V-22 delivers a scale VTOL flying experience that's unlike any other- and is a proud tribute to the groundbreaking original. At the heart of it all is exclusive flight control software that has been expertly tuned by our engineers. The end result makes it possible for many RC pilots with both airplane and helicopter/multirotor flight experience to successfully enjoy scale VTOL flight. Making the transition between helicopter/multirotor and airplane flight is as simple as flipping a single switch. The flight controller will automatically rotate the tiltrotors and activate the control surfaces as needed. Multirotor Stability Mode limits pitch and bank angles and automatically self-levels the aircraft when you release the sticks. 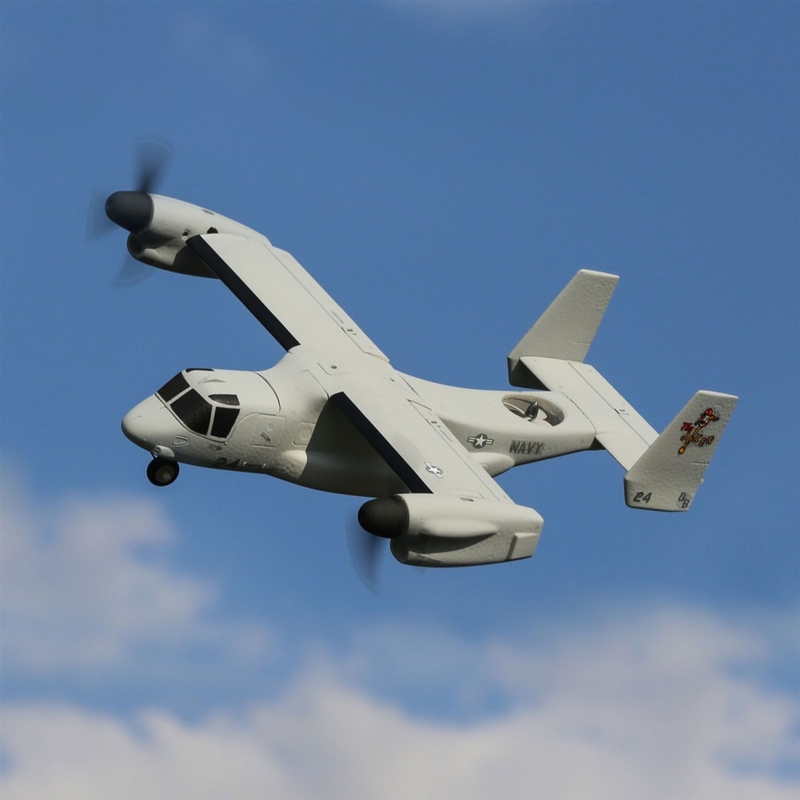 This helps to prevent crashes and makes it possible to take off and land vertically like a pro, even if you've never flown a VTOL aircraft before. Airplane Stability Mode automatically rotates the tiltrotors and activates the control surfaces for airplane flight. Pitch and bank angle limits, plus automatic self-leveling when you release the sticks, work to help prevent crashes. There are no angle limits and self-leveling is no longer active in the Airplane Acro Mode. This allows for tighter maneuvering and even provides the capability to perform some aerobatic maneuvers including loops and rolls. No tools are required to install (or remove) the included landing gear that features a castering nose wheel so you can taxi and perform 'rolling' take offs and landings. Or you can leave it off to simulate a 'retracted' gear look and for added performance. The included decal sheet allows you to customize the factory-painted finish with multiple military branch trim scheme options.